For registered BENEFICIARY with PNB Tokyo, please fill up the form below, double check the information you entered; then press the SUBMIT button. You may also call us to give us your remittance instruction. For New Remitter, New Beneficiary, and for first over 100,000 yen remittance, please use the Remittance Membership Registration Form (RMR). Please click here to get a copy of the RMR. For remittance of 1 million yen and above, proof of source of funds and purpose of remittance is needed. Instructions received after 3:00 p.m. will be transacted on the following working day. 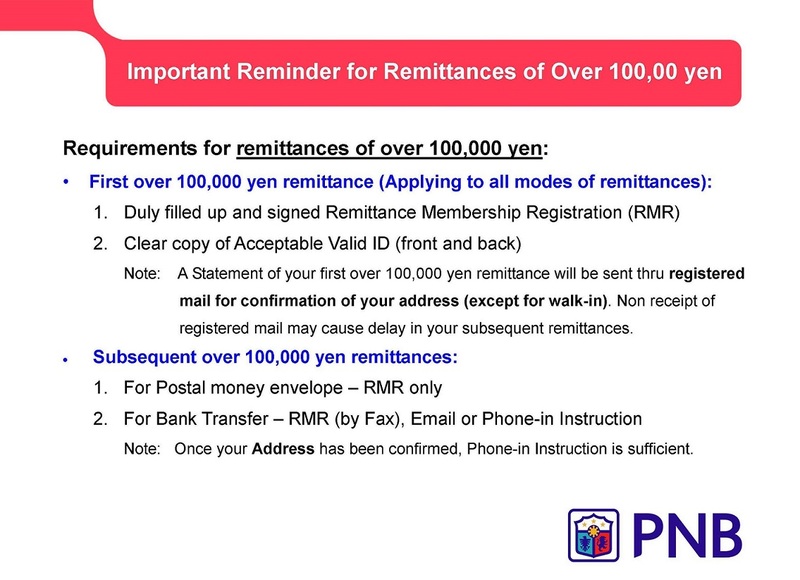 For those who availed the Virtual Access 10+ and Postal Link 10+, please confirm your JPY Deposit Account Number, KYC Code and amount of remittance.